March 17, 2017. This was one of my favorite images from this wedding and was taken at The St Lucie Trail Golf Club in Port St Lucie, Florida. Formerly PGA Country club, they changed the name only, to become St Lucie Trail for some unknown reason. One of the areas better venues, it features an outdoor wedding ceremony site right on the large green grassy area overlooking the lake separating the 18th green and the 10th tee for truly spectacular vistas. 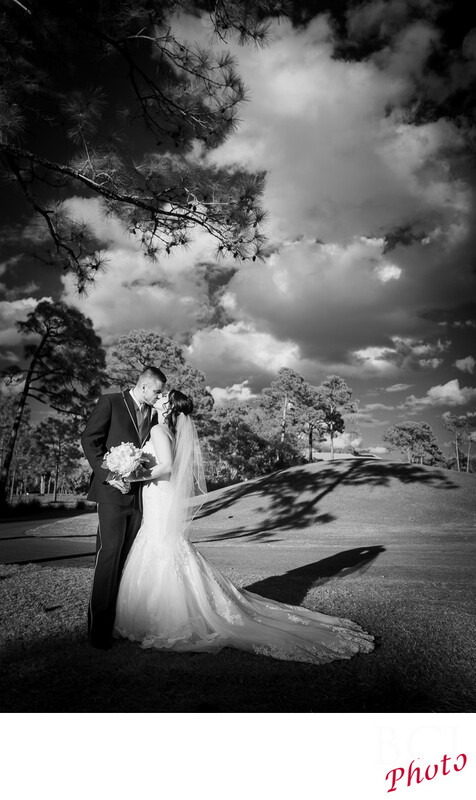 Typically weddings at PGA, take place in the late afternoon, which works perfectly with the angle of the sun from the right side, creating dramatic shadows and creating an ambiance like no other venue. After the weddings, St Lucie Trail also provides a magnificent backdrop for our romantic wedding portrait sessions allowing us some fantastic photos that we can capture in about a 20 minute time period so we can get you back into the air conditioning as soon as possible, and still deliver an incredibly diverse and amazing set of romantic wedding images at St Lucie Trail Golf Club. Once you go inside, the room has a natural divide to it, which allows the dancefloor to become the central focus point of the room. Recent renovations there have really opened up the room making it much more amenable to wedding receptions and events of all kinds.